Summary: Wet Monday but a dry mid-week. Small chance of storms Wednesday night into Thursday. Today is a wet and soggy one as our lawns are soaking in the rains from yesterday and today. While it is currently raining across the county, we officially have a 70% chance of rain with a high of 79 degrees. 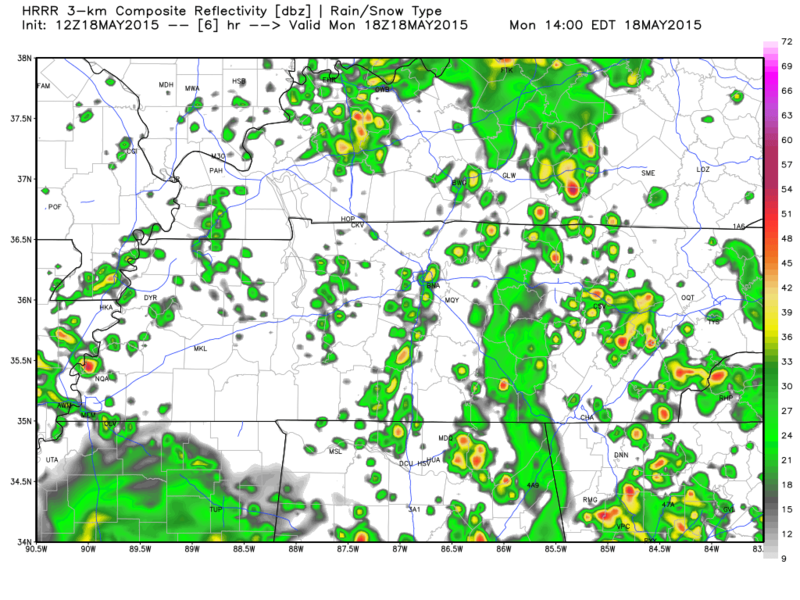 Spotty showers are expected to hang around for most of the day according to the HRRR model. Here’s the spotty showers at 1pm. And more spotty showers around 6pm. Have an umbrella with you today as you could very well find yourself under a spotty shower. 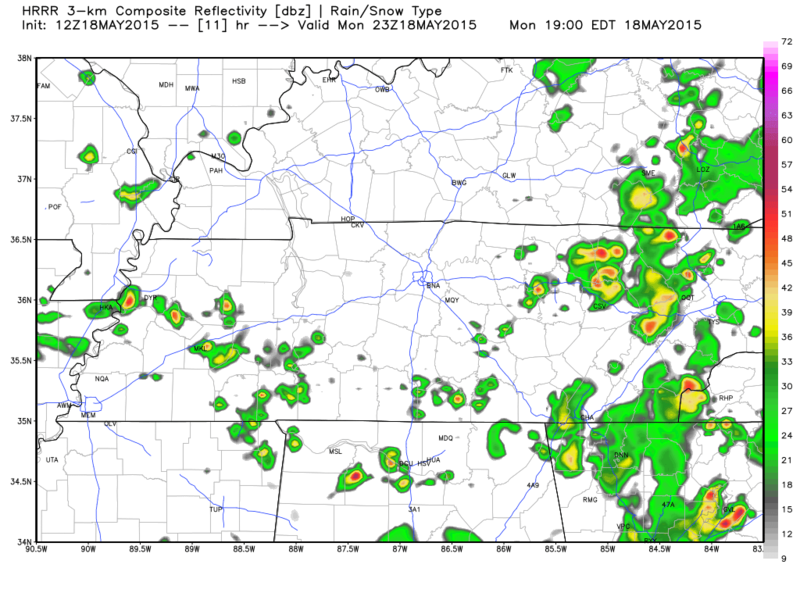 Entire HRRR simulated radar loop from 8am through 10pm tonight. Tonight, rain chances drop to 40% with an overnight low of 64 degrees. The cold front that has set off these showers and storms will come through overnight, pushing the rain out and leaving slightly cooler temperatures for us. Mid week dries out a bit before another brief chance of rain. High pressure sets in giving us fair weather for Tuesday and Wednesday. Tuesday will be dry with a high temperature of about 79 degrees under sunny skies. Winds will be a bit breeze at 10 mph out of the north, so it will feel just a bit cooler than 79 degrees. Tuesday’s overnight low temp will fall to about 54 degrees with a few clouds in the sky. Clouds start to come back on Wednesday as our temperature will reach about 78 degrees. Rain chances start increasing as we go into Wednesday night with a 30% chance of thunderstorms and an overnight low of 57 degrees. Thursday also sees a 30% chance of rain and storms with a high temperature at a cool 73 degrees. The weekend is shaping up to be pleasant and dry. Most of the weekend shall be pleasant for any outdoor activities you may have. Friday will have a high temp of about 74 degrees under mostly sunny skies. Saturday’s high temp will be about 81 degrees under mostly sunny skies. No rain chance for Saturday. Sunday there is a 30% chance of rain with a high temperature of 82 degrees. Wondering if you will be able to grill out and chill in your yard this Memorial Day? Models are showing that you may want to have an indoor plan. 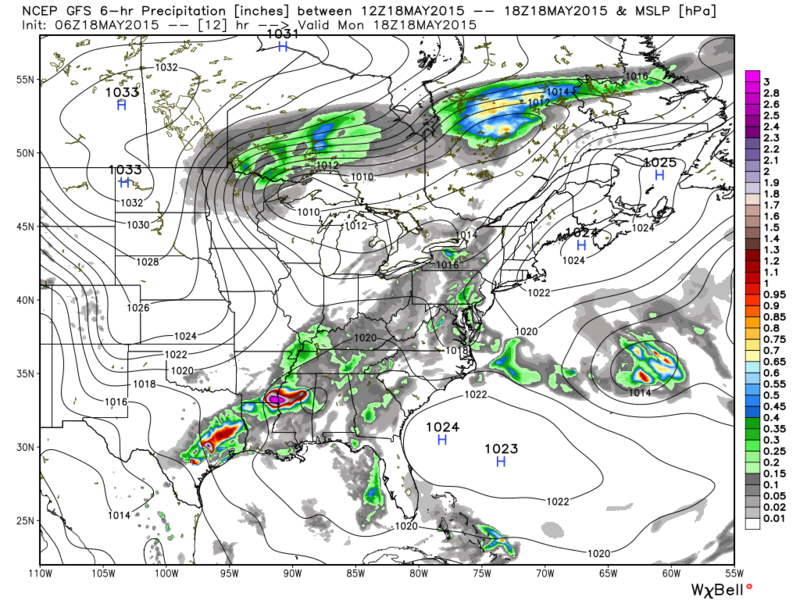 The GFS model looks 16 days into the future and guesses what the weather might be. Here’s it’s prediction for Monday mid day. Ask the Canadian model and you get about the same answer. Here’s midday Monday. 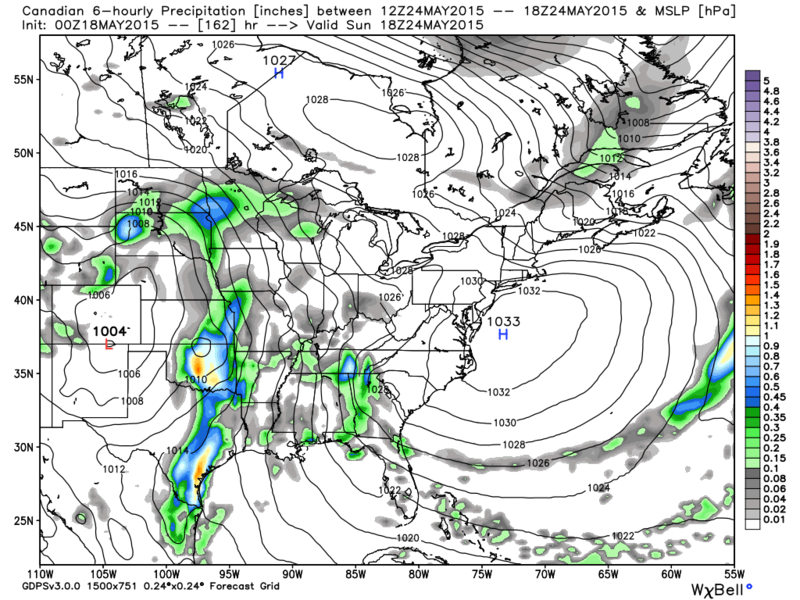 These models show some discrepancies (as it should it is more than a week out). but they both seem to think we may get at least a tiny bit of rain. It’s too early to tell much other than there’s a chance, but we will keep watching it and updating it for you during the week.